In the SRBP chart of all polls in the sequence in which they are release, the fall for each party appears more dramatic than it is. 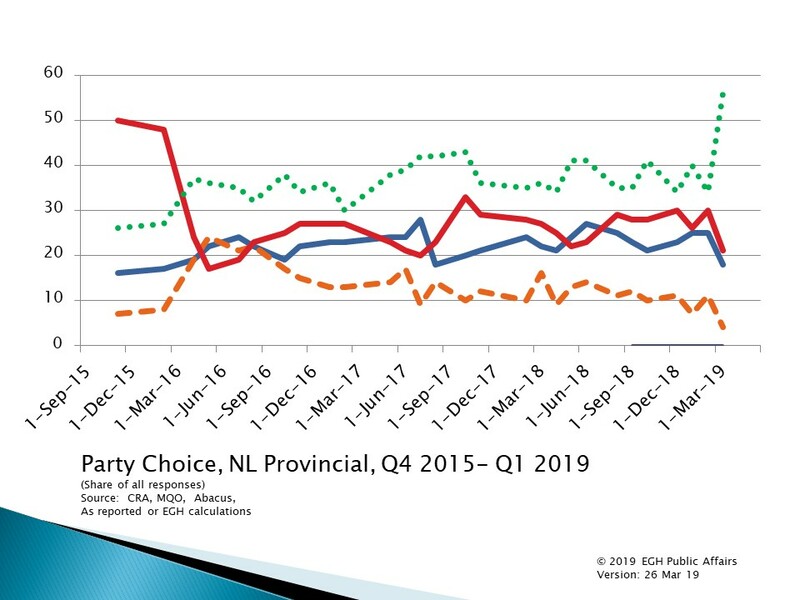 That's because the poll released before this - CRA's February omnibus - had the parties slightly higher than MQO found them in January. The MQO before that was presented by media at the time it appeared as showing the parties in a statistical tie. If you look at the MQO numbers alone, though, they show now a consistent downward trend for all parties. The drop is especially bad for the NDP. Since 2011, the party has never polled this low, although it has been below 10 percent of respondents several times. The party choice results are mirrored in the responses to MQO's question about which leader would make the best Premier. Support for all three party leaders dropped.